We offer wide range of Utrasonic Cleaners For Medical Instruments. tese cleaners are very effective in cleaning of medical instruments, a primary requirement in the medical field. Avail fom us this range at industry leading prices. 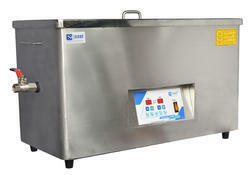 Ultrasonic Cleaners for Medical Instrument has its utilization in a number of medical institutions. Cavitation bubbles penetrates blind holes, cracks, and recesses. The intention is to thoroughly remove all traces of contamination tightly adhering or embedded onto solid surfaces. Water or solvents can be used, depending on the type of contamination and the work piece. Looking for Utrasonic Cleaners For Medical Instrument ?